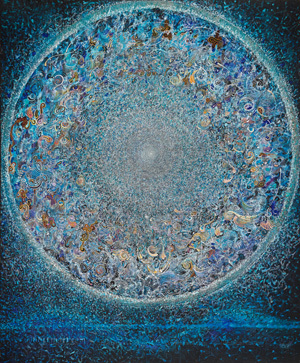 This incredibly detailed 6 x 5 foot 'Dark Mandala' was painted over a five-year period and signed and dated in 1989. The central core of the composition is like a dense spiral nebula of exploding fragments, or asteroids swirling around a source of light like a swarm of intoxicated moths. Salvador Dali developed a similar technique of explosive chaos when he developed his 'quantum gun', which fired thousands of metal tacks and nails into a wooden board. But all of the 'shrapnel' in this Dark Mandala are individually painted. As these myriad fragments move out from the centre they begin to coalesce into John's typical colourful calligraphy of spiral and coiling forms, and lines that curve and arc like sperms, meteors or comets. I do not want to find words to explain my paintings; I want merely to paint. My painting becomes automatic writing. The calligraphy making statements that jump out of the colour and explode in the spectator's mind, planting seeds of warmth and cosmic force. Woke with a shock. Exhausted - heavy sleep, then: I am Cherry, she is me. The incredible high she has is because we are the same person. It is a vision of God. As I had the realization I suddenly feared for my sanity, and, simultaneously into the pain flashed thoughts of primitive people who see insanity as very God given indeed. No wonder! The vision and realization of God, suddenly seeing him, each living entity in a way being a molecule of his body is more than breathtaking. It is very spectacular being trapped in our skull as a supposed individual entity, when suddenly with Road to Damascus intensity "I am the Flesh" becomes real. Part of me still thinks that this knowledge is improper to grasp within life on Earth. I fear being ready now to move on to the 'afterlife', as I want a lot more time on Earth. Have I seen something forbidden? I am frightened for myself, although deep down under the panic is the remembrance of the vision I had when a boy of about eight or nine years. Lying in bed, alone, frightened of the dark. Mother out working, not yet back. Pulled the bedclothes more over me for sanctuary, safety. Still it came, creeping towards me, the monster, the darkness, I could not put form to the 'fear entity', yet still it came near threatening. It would get me. It would hurt me. Then I suddenly realized it could not hurt me, for I was not a twig in the stream, I was part of the stream itself. I was the living force. For a moment my ego, my individuality, dissolved and I had a synaesthetic awareness of seeing God. The Life Force had given me eyes to see itself.